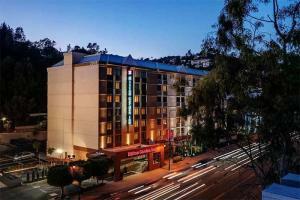 Set in the heart of Hollywood, this hotel is located near Universal Studios, Hollywood Bowl and more. The hotel features a fitness center and outdoor pool. Comfortable guest rooms provide a welcome retreat after a busy day out, offering the Hilton Garden Inn Serta Perfect Sleeper Bed, Wi-Fi and more. Located in Los Angeles, about 12 miles from LAX.